Hey, golfers, want to enjoy some birdies? Then check out the beautiful bald eagles viewable every day thanks to a Tennessee golf course's "eagle cam." Back in 2010, a pair of bald eagles - since named Eloise and Elliot - showed up at the Bear Trace at Harrison Bay golf course in Harrison, Tenn., and built a nest. They've been there ever since. The first aim of course superintendent Paul Carter, after he noticed the eagles, was to figure out how best to protect the birds, which are, after all, our nation's symbol. And his second thought was, "how can I show off these magnificent creatures?" Carter and his staff wanted to get a closer look at the nesting activities of Elliot and Eloise and also share it with the public. The USGA echoed Carter’s enthusiasm when asked for help with the project. Carter and his staff installed a camera in the tree in 2011 and provided a live Internet feed at harrisonbayeaglecam.org. After receiving positive feedback the first three years, Carter wanted to give Elliot and Eloise’s fans a better viewing experience this year. Again with the USGA’s assistance, Carter was able to install a pan/tilt/zoom camera to follow the eagles outside of the nest and zoom in on the eggs, as well as a microphone to pick up their verbalizations and infrared capabilities to observe them at night. And right now is an exciting time for the eagles: chicks are expected soon. I checked in on the webcam just before writing this and Eloise (I assume - they aren't wearing nametags) was sitting on eggs while making adjustments to her nest. Eggs are expected to begin hatching sometime around March 11, the USGA says. If the player above isn't working for you, go to harrisonbayeaglecam.org. What other kinds of golf are there, besides real golf? Well, there's miniature golf. There's frisbee, or disc, golf. There's something called Power Play Golf. And now there's footgolf. I just heard of footgolf thanks to a post by Golf Digest, which notes that "instead of golf balls and clubs, there are soccer balls, and extra big holes to accommodate them." That's really all you need to know about how to play footgolf: It's exactly the same as golf in most ways - you start play from the teeing ground, propel your ball down the fairway, toward a green, and into a hole; it uses golf rules and can be played on either a real golf course (with much larger holes cut on or adjacent to the greens) or a purpose-built course. The larger cups are obviously needed to accommodate a soccer ball. FootGolf does not "compete" with Golf. FootGolf does not "compete" with Soccer. FootGolf can be as fun or as competitive as you want. FootGolf is a game on its own and it has been played since forever around the world in farms, parks or streets, under different names and rules. As a sport, it is played on golf courses and is regulated worldwide by the FIFG. The first tournament was organized in Europe in 2009 and it was introduced in North America by the American FootGolf League in 2011. As of today, the American FootGolf League has established and accredited 66 FootGolf Courses throughout the Continent. 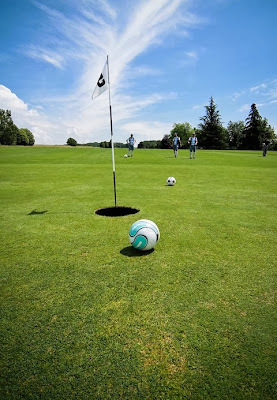 The AFGL pitches footgolf as a second income source for traditional golf courses, noting that the 21-inch cups can be cut in areas of rough adjacent to the regulation golf green, rather than on the green itself. That saves golf courses from having to close holes to golfers in order to accommodate footgolfers. A map on the AFGL website shows there are currently 60 golf courses in the United States that allow footgolf, three in Canada, two in Mexico and one in Puerto Rico. The world footgolf governing body - FIFG (Federation for International FootGolf) - was established only 2012. FIFG shows that footgolf is represented by country organizations such as the AFGL throughout western Europe and also in Australia, South Africa and some South American countries. In other words, footgolf is a very young sport that is already surprisingly available, and is already - surprisingly - having some success in getting traditional golf courses to set up footgolf "cups" on or next to their greens. The advantage to footgolf is obvious: It requires nothing but a soccer ball. That makes it much more affordable than real golf to play. Things like this make me wonder if the real threat to traditional golf is not from competing sports or unrelated activities, but rather from alternate versions of golf itself. It's the time of year when Augusta National Golf Club is sending out invitations to play in the The Masters. Back in the old days, this was how you got into the tournament: you waited for an invitation, which would be coming your way only if the club's tournament committee decided to send you one. While The Masters is still, technically, in invitational, the invites today are based on a series of qualifying criteria. Any golfer who meets the criteria gets invited. 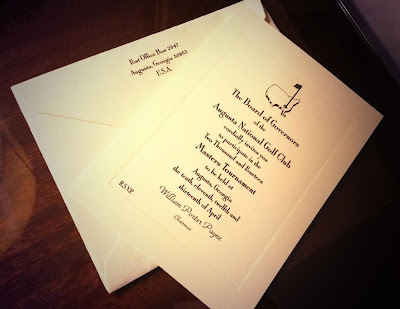 But Augusta National still mails out old-fashioned paper invitations to golfers who've qualified. Where can you get the best burger in Orlando? According to readers of the Orlando Sentinel newspaper, at Graeme McDowell's restaurant, Nona Blue Modern Tavern. The newspaper's 2014 Foodie Awards recognizes the best Orlando restaurants in various categories, as voted on by readers. Nona Blue won five awards from readers, including best burger. A look at the Nona Blue menu shows two burgers. One is called the All American Burger, costs $11, and is described as "Fresh ground blend / American cheese / Lettuce / Tomato / Red Onion / Pickle / Mayo / Mustard / Toasted brioche." Pretty standard burger, except for the brioche. So the burger that won Nona Blue the award is probably the $13 Nona Blue Burger, which is also served on a toasted brioche but comes with bleu cheese and smoked bacon. Nona Blue also won Sentinel Foodie Awards for best bar menu, best outdoor dining, best new restaurant and best wine list. "On my weeks off, going and hanging behind the bar and hanging with customers is something I'd love to do. Owning a restaurant and being part of that scene is something that has always been with me." There are 49 wines, 24 beers on tap. There is steak, fresh fish and lobster. Light fare includes deviled eggs with apple wood smoked bacon, oysters and numerous sandwiches. Of course, considering McDowell's home country, there is a Shepherd's Pie and an all-day breakfast with an Irish theme. And the must-try dish has got to be the G-Mac and Cheese. "It appeals to all comers," McDowell said. "We're really trying to hit every market. Our theme is we do good food done well." Tiger Woods Impersonator Arrested for ... Um ... Sexting Threats? Whoa, whoa, wait just a minute - that's it? So being a "Tiger Woods impersonator" just requires being a black guy who puts on a Nike cap and a red shirt? OK, maybe this Canh Oxelson fella bears a superficial resemblance to Tiger, but it's not a very strong match, in my opinion. And there doesn't seem to be any effort to actually impersonate Tiger, as in sound like him, act like him, give the impression of being him. I'll give Oxelson this: Early in his "career" as a "Tiger Woods impersonator," he was skinny, just like Tiger was back then. Later on, Oxelson was much bigger, just as Tiger had gotten. Tiger Woods is notoriously prickly and uninformative when it comes to dealing with the media. What about Cheyenne Woods? What is her attitude toward the media? Well, given that she is sometimes part of it (doing on-camera work for the fledgling Back9Network), it's not surprising that Cheyenne is far more generous and friendly in media interviews. 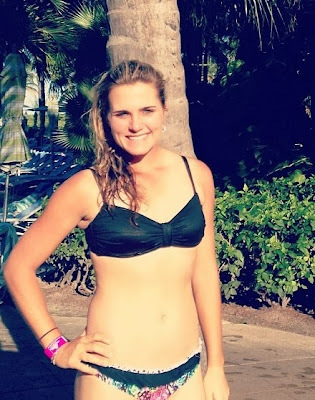 In fact, in this video, recorded by Golf Australia prior to the Women's Australian Open (and in the wake of Cheyenne's victory at the Australian Ladies Masters), Cheyenne says of doing media work, "I think it's fun. It's a part of being on tour, it's a part of being a professional athlete."